Tired of posting, sharing, liking, commenting and doing things using FACEBOOK and TWITTER without gaining anything? Actually, there is already a social media site that gives revenue in every original post you do, by liking, and commenting and that is BUBBLEWS. Been here for almost 4 years now and I am grateful to be a member of this site. And now it is nice to know that there is a modern and latest social network that gives you revenue and that is 'tsu'. 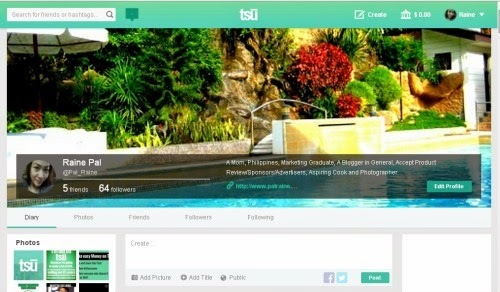 Why not try tsu, a free network that gives the SOCIAL REVENUES back to you! I'm certain you feel SICK of Facebook and Twitter the likes of selling out its users and exploiting people who originally create the content that makes them rich. Oh well, if you feel that way we are on the same sentiments. 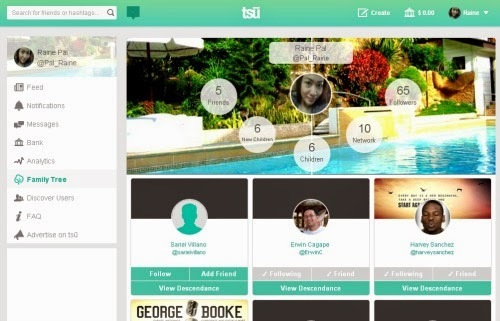 Tsu is the right place for you to earn and at the same time socialize. There aim is to REWARD its users and own their works. Everyone is free to join by posting and sharing their thoughts, write original articles, share owned photos/images and with that you will be REWARDED. Got it? If not here's a video that will give you idea about The PHILOSOPHY of TSU. The problem is that you create social content but you get NOTHING. Isn't it so unfair that these social medias USE you? Get your CONTENT and your AUDIENCE that you should OWN IT! What is the different with TSU compared to the others? REMOVING ourselves for SIGN-UP process. 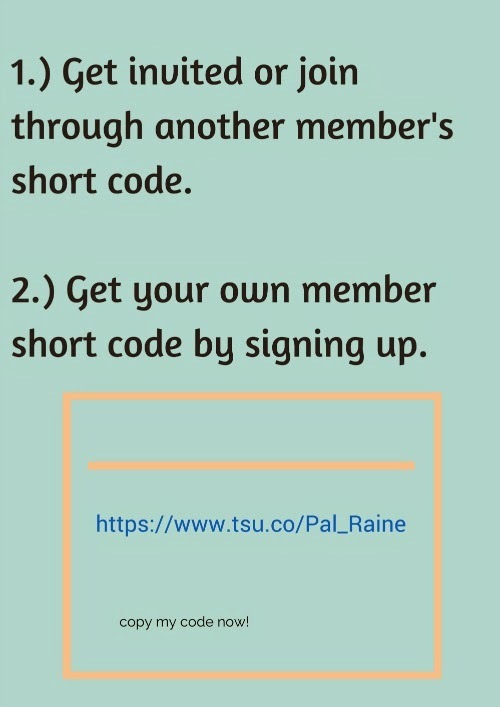 Everyone who are already members with TSU has its own MEMBER CODE, this code will be use in order to become a member too. 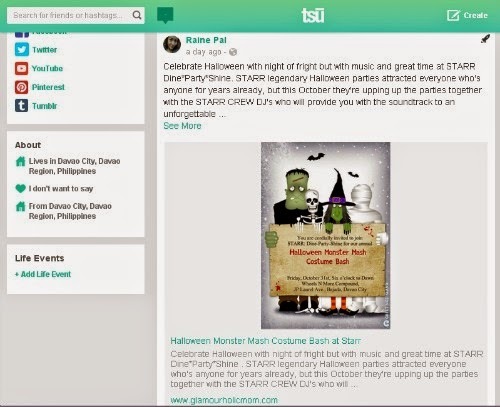 It is very easy to get familiarize with 'Tsu' because its format looks like FACEBOOK. Here I post my article from one of my site, the system will automatically post the desired photos from your site and you don't have nothing to worry uploading images, and if you don't like the image you can click the X to remove and move the cursor to your best image. 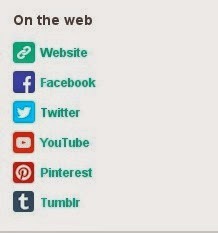 Another thing that I like about this site is that you can SHARE your site and other social medias. I know that you are eager to see the analytic side of it. By the way, I only joined yesterday, so expect that I don't have that earnings yet. But I want to share what I've discovered from the site. See my PROGRESS? 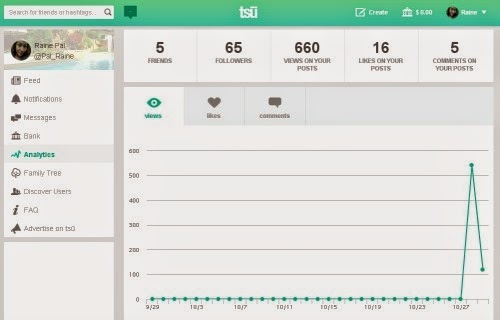 Here it will tell you how many 'tsu' members VIEW your profile, LIKE any of your post and give COMMENTS. You will also see how many FOLLOWERS and FRIENDS you have in your FAMILY TREE. FAMILY TREE? What is that? One of the things that you can EARN more REVENUES is to have a BIG NETWORKING FAMILY TREE. The more you invite, the more chances of GAINING. Once you CLICK MY CODE you are included to my FAMILY TREE basically you are my downline. This is not a NETWORKING wherein you are going to sell anything or any products online. Accept Tsu peer-to-peer payments. What is this? 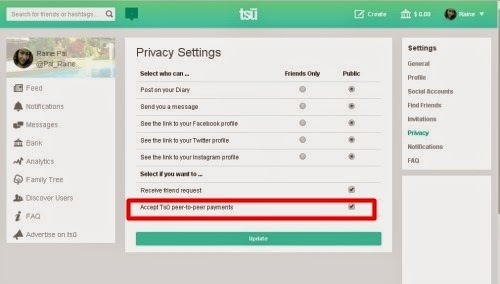 If you want to to receive any revenue from Tsu, you have to go to your settings, select PRIVACY and CHECK "Accept tsu peer-to-peer payments". The question here now, if we can get money from Tsu. Let's see because the site is less than a week old. And I am new here also, it's early to tell. At this stage this site is good. I love the platform use, very fast, good to the eyes and easy to use. Nothing to worry because patience is a virtue, right? We will wait for the positive and negative scenario. For now, I love posting my site links here. This is another opportunity for me as a blogger to SHARE my articles in order to gain views. Good luck with Tsu and I do hope you earn a lot from their network. Thanks Franc. I'm keeping my fingers crossed. This is my first time to hear about Tsu. I think it's another good channel where you can share your articles and be seen online. Seems like a good one. Will be waiting for your update about this site. I hope you earn more. It actually sounds more complicated when I finished reading. 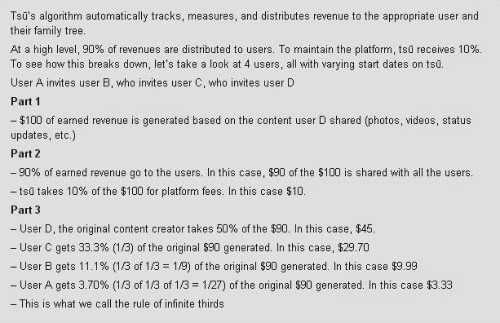 All the percentages about revenues got jumbled in my head. But I might try this out as well. I checked the site and it needs member's code. 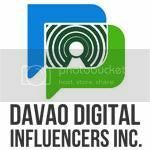 It's similar to MLM social media sites wherein, when the site's getting older, it'll getting harder to monitor your revenues. I think this kind of method (member's code) before signing up is not suitable for some. It's like blogging but I'll try for your code. Somebody invited me to tsu already, but I'm not yet sure if I want to join. Does it bring traffic to your site?